Call to Australians: catch most deadly spider! The Australians Australian Reptile Park has called to hunt the deadliest spider in the world: the Australian spin tunnel. The stock antidote to the fatal bite of the tunnel spider is running out, reports the Australian Reptile Park, the only place in Australia where the antidote is made. The stock antidote can be supplemented with poison from the jaws of the tunnel spin. If someone is bitten by a spider tunnel dies within hours if he gets no antidote. ‘Stone iceberg’ floats in Pacific! The crew of a New Zealand Navy ship yesterday when she had to look twice as a gigantic amount of volcanic rock saw floating in the Pacific Ocean. It resembles an iceberg and consists of lightweight pumice, which is emitted by a volcano under water, according to the Navy. The rock was yesterday by an aircraft of the air force discovered, about 1000 kilometres off the coast of New Zealand. The Navy was warned and who sent there on a ship. Scientists who with the naval vessel entrainment, thinking that the pumice stone originated from the underwater volcano Monowai, who recently was active. The ‘ iceberg ‘ has a size of stones 26,000 square kilometres, almost as big as Belgium. Halloween-achtige taferelen in het Australische Wagga Wagga. Door de regenachtige weersomstandigheden heerst er een overvloed aan spinnen. Complete weilanden zijn bedekt met een dikke laag spinnenwebben. Tip: heb jij deze foto’s al gezien? Halloween-like scenes in the Australian Wagga Wagga. Due to the rainy weather there is an abundance of spiders. 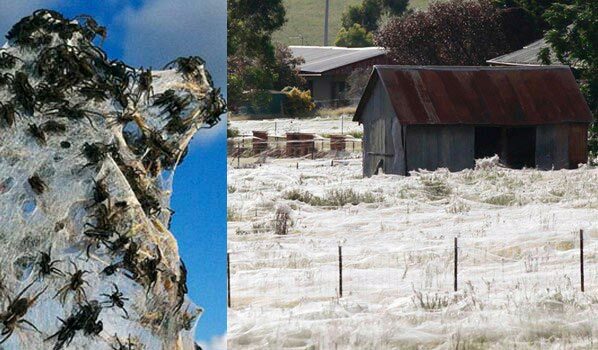 Complete meadows are covered with a thick layer of cobwebs. Tip: have you seen these pictures?